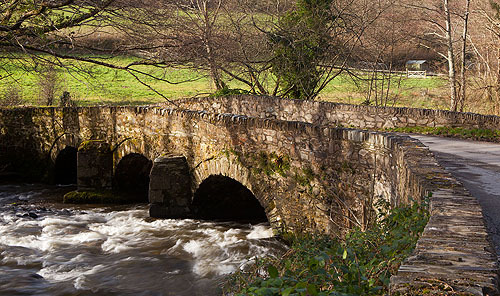 The stone bridge over the Afon Gwaun at Llanychaer. Llanychaer Church has the 7th-9th Century "Crucifixation Stone" in the churchyard , enclosed within a railed enclosure. Difficult to make out the decorations , which are on all 4 faces !. Incised crosses on 2 of the faces , Christ above a flower in a circle on another face and a Large Ring Cross on the 4th face.